City Council Member Elizabeth Brown stopped by for a visit recently. I invited her over to “put her eyeballs on the land” as my friend Chris would say. The council is currently finalizing the Columbus Green Business & Urban Agriculture Strategic Plan, the focus which “is to enable, support, and grow green businesses and urban agriculture facilities within the City of Columbus (p. vi).” While a plan isn’t policy, but I’d like to think its progress. After meetings with the OSU Franklin County Extension’s Columbus Urban Farmers Network, I have a developing awareness of the plan and some related efforts (See: Green Memo III and City of Columbus Food Action Plan). However, I still have a lot more questions than understanding, and I’m still unsure how such the plan will relate to my objectives and activities at Over the Fence. What is clear, however, is a need for advocacy for the work we and our friends on other growing sites in town are doing. As a group, the network has discussed communicating with elected officials about the work we are doing, sharing our triumphs and discussing our challenges. I saw the GBUA plan as a doorway, an invitation to a conversation with stakeholders and I was ready to knock on it. Planning the visit with Elizabeth’s aides over email I confessed that I didn’t really know how to plan for our meeting. I wrote: “I’ve never done anything like this before so if you have any advice, let me know. Otherwise, I’ll just plan to show her around, let her ask a few questions, and share a few of mine.” They said a tour and conversation would be great so when she arrived I took her out back. My biggest regret from our visit happened at this moment. We stepped inside the gate, took a pause for an initial lay-of-the-land view and that’s where we stayed for the next half an hour. NOTE TO SELF: WALK FOLKS INTO THE SPACE, DON’T STOP AT THE GATE! The farm is an immersive experience. In order to get a sense of its magnitude, you must walk the rows and look at the variety of things growing. You can’t just peek over the fence, you must cross the threshold and step inside. Fortunately I convinced Elizabeth to harvest a little spinach before she left (joking that it would make a good photo op for us both – see below). So she had a moment in the space but next time around I’m going to make sure the tour is more active. Elizabeth asked what policy makers could do to help folks like me and what they do that gets in the way. I reported that while I have supportive neighbors who are happy to see my farm from their backyards, others are not so lucky. Our city’s complaint-driven zoning enforcement means someone like me – a white, middle-class woman living in Clintonville (a progressive neighborhood) – can do pretty much whatever I want as long as I clean up my toys at the end of the day and don’t turn the radio up too high. Other friends north and east of here have had to talk to police summoned by neighbors who felt inappropriate things were happening, like vegetable plants in the front yard, chickens in the back. Should one of my neighbors sell their house and a new, not-so-hip-to-urban-farming individual move in, I might find myself in a different situation. I’d like to know that the folks downtown has my back, that there are some regulations in place that will protect my efforts from any one individual who might not be into what I’m doing. Beyond my general concerns about some unknown the future, I am concerned about growing my operations and encouraging others to start similar projects. The latter is a prime objective of mine. I’d like to see a farm like ours on every block of the city, with neighbors working together to feed one another. But, as far as I understand, under current zoning rules, a CSA (community supported agriculture) endeavor is considered a business and therefore not permitted off a residential lot like ours. Elizabeth and I discussed the complications of rezoning a single lot as agricultural and the possibility of some sort of permit or certificate to operate a small scale farm like ours as a business on a residential plot. I’ve had a few other thoughts since Elizabeth was here. One relates to water. We’ve been having major dry spells this spring and I’ve had to water the plants a lot. I am still hoping to have a deduct meter installed so we don’t have to pay sewer fees on water we use on the farm, but that is a process that involves not only installation but also certification with the city’s Public Utilities office. From what I have heard, the city has not made this process easy for folks in the past. I wonder if the GBUA plan can help us get some kind of urban farmer water policy and practices put into place. For instance, if residents have water restrictions placed on us during a drought, could we have a variance to water our crops to keep them alive? 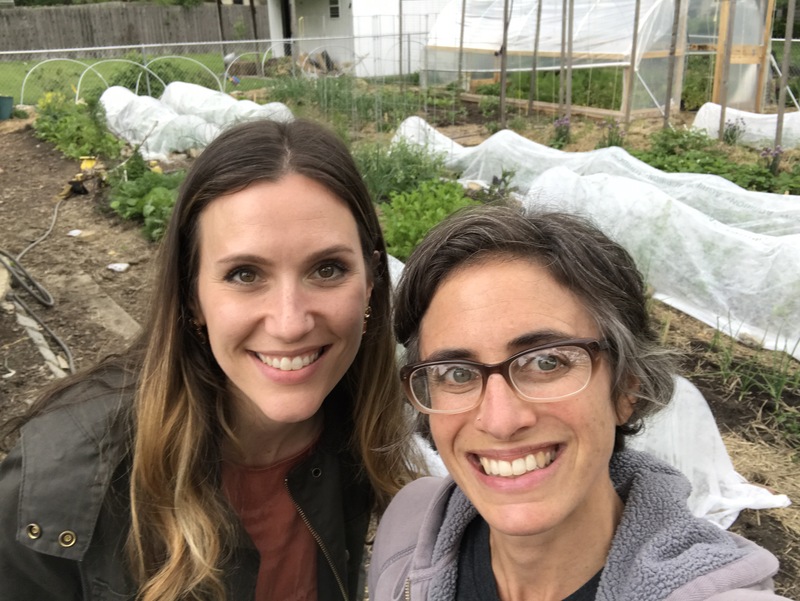 I hope more folks trying to make a living growing food in Columbus will get in touch with Elizabeth and other members of the council to keep the conversation going. Mine is only one perspective, one experience in urban agriculture, and I think it’s important for policy makers to hear, and to see first hand, the spectrum of activities being done in Columbus in the name of urban agriculture. Categories: In the Footsteps of a Farmer | Tags: 614farms, City of Columbus Green Business and Urban Agriculture Strategic Plan, Clintonville, Columbus Urban Farm, Columbus Urban Farmer Network, Elizabeth Brown Columbus City Council, GBUA, OSU Extension Franklin County, Site Visit, Urban Agriculture Advocacy, Urban Agriculture Policy | Permalink.